Hamas spokesman refers to Israel as a "cancer", calls on Islamic nation to eliminate it. Abu Obeida, a spokesman for Hamas's so-called “military wing” the Al-Qassam Brigades, called on the Arab and Islamic nation to stop any internal fighting and work to eliminate the "cancer" that is the "Zionist occupation." Abu Obeida's call came on the occasion of the Iranian Al-Quds Day, which was started in 1979 by Iranian revolutionary leader Ruhollah Khomeini and is intended to emphasize the Muslim world's responsibility to "free Palestine." In an official statement marking the day, Hamas urged the Islamic nation to support “Palestine” and the "fighting" Palestinian people and support their "heroic" fight in preparation for the liberation of “Palestine” from the occupiers. 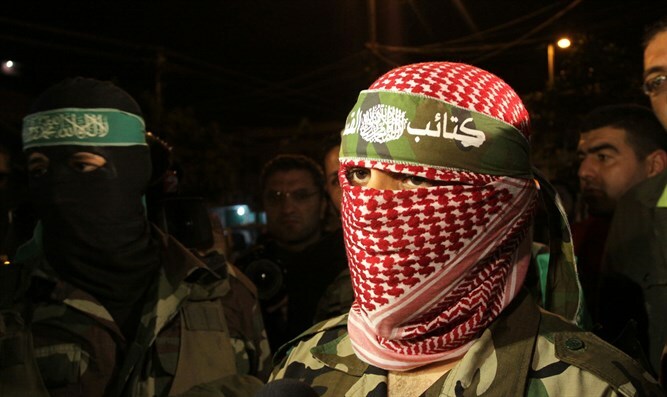 Meanwhile, Hamas spokesman Sami Abu Zuhri said that Israeli threats of war do not frighten the Palestinians. "The occupation must think carefully before making any decision about starting a war because the rules of the game will not be the same as before," Abu Zuhri wrote on Twitter. Al-Quds Day, which is marked on the final day of Ramadan, is generally used to incite against Israelis and Jews. Gazans held parades marking Al-Quds Day, during which Hamas lawmaker Ahmad Abu Hilbiyya said that Jerusalem and the Al-Aqsa Mosque are being "viciously attacked" by Israel, and "several victims have already died." Hilbiyya called on Palestinian Authority chairman Mahmoud Abbas not to expel "fighters" and jihadists from Judea and Samaria, but to allow them to fight with the "occupation" and support the Al-Quds intifada in any way possible. Abu Zuhri's threat to Israel comes just days after deputy Hamas leader Khalil al-Hayya claimed that the group is not interested in an escalation with Israel.